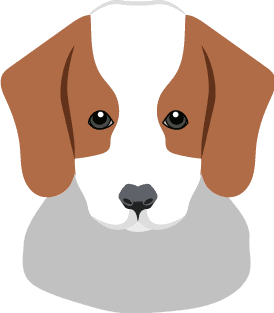 Home Blog Puppy Care Baby It’s Cold Outside! 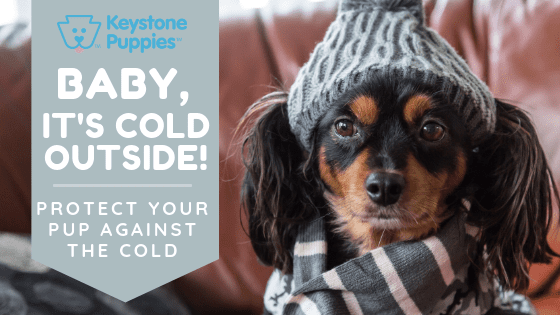 Don’t Let Your Pup Get Too Cold This Winter! While some Snow Breeds like Siberian Huskies and Samoyeds can’t get enough wet, snowy days, breeds with short coats or smaller bodies like Dachshunds and Boxers, or smaller dogs like Toy Poodles and Bichapoos have trouble staying warm on cold days. No matter which breed you choose, all types of dogs need to go outdoors in the winter to relieve themselves. And even dogs with heavy coats will feel the winter chill if they are accustomed to a heated home. That’s why it’s so important to protect your dog when the temperature drops below freezing, or your pup could experience hypothermia, get frostbite or, in extreme cases, die. If You’re Cold, Your Dog is Cold. The best rule of thumb for a dog is that if you’re really cold, they’re really cold. If your nose is getting numb, their nose is too. Same with ears and paws. While some dogs are built to thrive in winter weather, most are not. That means you need to carefully monitor your dog’s ears, nose, and paws. If a dog is shivering or standing still with tail and head down, he is uncomfortably cold. Get him into a warm house as soon as possible. However, you need to take your dog outside to relieve himself. To keep your pup more comfortable during these times, a coat and booties or dog boot socks are helpful. If your pup won’t wear booties, you can coat the pads of his paws with paw wax. It will provide a thin but useful layer of protection. A few dogs will wear hats, but most find them uncomfortable. You may be able to find a dog parka with a hood that protects your dog’s ears. No matter how bundled up your dog is, keep walks short when the weather gets below freezing. You may find that your dog needs five or six very short walks a day instead of two long ones. Icy crystals are painful to pup’s paws, and salt deicers can be poisonous for dogs. That’s why winter booties are a good choice for dogs that are sensitive to the cold, and for dogs that must walk on sidewalks or pavement, or on uneven or hazardous terrain. Look for booties, boots, or snow socks that have a textured sole to prevent slipping. Booties should fit snugly, be adjustable and be completely waterproof. If your dog dislikes booties, remember that paw wax can also provide some protection from the cold, and can also protect his paws from icy cuts and road salts. When your walk is over, take time to clean your puppy’s paws. Make sure to remove road salts, deicers or even antifreeze. These substances can build up on paws and can make dogs sick if they’re ingested. Have a towel ready to wipe your dog’s paws each time he comes in from the cold. Take a few moments to probe the pads of his paws gently with your fingers to remove ice and snow. If your dog has even a slight limp or is walking gingerly, check for cracks or bleeding, and treat immediately. For more paw cleanup tips, click here to read the Keystone Puppies blog, Muddy Paws. Puppies under six months and older dogs are more susceptible to the effects of cold. That means they feel the cold more severely, they can tolerate less cold, and they are more prone to cold-related afflictions such as hypothermia. Very young and very old dogs are also susceptible to cold, so limit their time out of doors during the winter months. Fireplaces, space heaters, and wood stoves all present burn hazards, so keep your dog safe by surrounding these areas with screens or gates. Remember that people can track in toxic salts, deicers, and antifreeze, so clean, sweep and mop entry areas regularly. 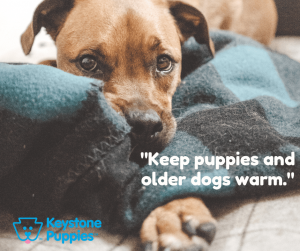 Keystone Puppies cares about the well-being of every dog. Make sure you understand your breed’s ability to withstand cold and accommodate your pup’s needs. Limit time outdoors in extreme cold, and never leave a house dog out in the cold unattended for long periods of time. Talk to your vet about your pup’s susceptibility to hypothermia and frostbite and prepare accordingly. If you’re not sure which breed of dog is right for you, start by researching over 200 breeds here. If you know which kind of dog you want, click here to start looking for the pup that is right for you.